March 30, 2017, 11:17 a.m.
By Laura Hazard Owen @laurahazardowen March 30, 2017, 11:17 a.m.
Just about a year ago, during the primaries, 122 Republican members of the national security community signed an open letter opposing Donald Trump’s presidency. “We have disagreed with one another on many issues, including the Iraq war and intervention in Syria,” the signatories wrote. “But we are united in our opposition to a Donald Trump presidency.” The letter was picked up by news outlets around the world and is still cited in articles written now that Trump is president. Evans never thought he would be in media. After graduating from college in 2005, he was interested in working in federal law enforcement and went to Washington, D.C. to do research on Islamist groups, then got a master’s in intelligence and international security at King’s College in London and worked at a think tank called the International Center for the Study of Radicalization and Political Violence. “I reached a point where I was tired of writing about what other people were doing,” he said. In 2010, he joined the U.S. Army in a program that sent people with social science backgrounds to brigades in Iraq and Afghanistan to help them better understand the social, cultural, political, and economic layers of the conflict. His time in Afghanistan “made me a lot more modest about what American power can accomplish in the world,” he said. Evans started War on the Rocks as a podcast in 2013, then turned it into a site “that I never planned on being anything more than a hobby.” He began to realize it could be more than that in late 2013, when General Martin Dempsey, the 18th Chairman of the Joint Chiefs of Staff, reached out to Evans to arrange the Chairman’s first-ever podcast interview because he thought War on the Rocks was the best way to reach the rank-and-file of the military. Then, “I knew we were on to something special,” Evans recalled. It turns out, in addition to more content (which we can and will give you) you want more opportunities to interact with two buckets of people. The first bucket is for experts who write for us and participate in our podcasts. You want to hear more from them and interact with them more directly. The second bucket is for other people like you: servicemembers, wonks, civil servants, think tankers, grad students, Hill staffers, veterans, aid workers, etc. You are a community. You want to talk to each other. And social media is not quite doing it for you. First, we have the WarCasts. These are weekly webcasts moderated by yours truly featuring a rotating cast of experts prepared to help explain geopolitical developments as they unfold. If you want, you can watch live and even ask questions live. Or you can watch later at your leisure. Think of it as the weekly think tank panel of your dreams, but you don’t have to be subjected to those terrible sandwiches or the one crazy guy in the room grabbing the microphone. Second, we have the War Hall. This is a members-only discussion forum where you can interact directly with our writers and each other, take part in our members-only book club, and keep your finger on the pulse of the national security community. The War Hall is built explicitly for people like you to engage with our experts and others like you. Other platforms have tried to solve this problem and have failed: We all get too many emails already and email distro lists are cumbersome. Twitter is too noisy and there are more trolls now than ever. Not all of our Facebook friends want to hear our latest thoughts on Army acquisitions, Russia’s military posture, or the intricacies of jihadist ideology. In the War Hall, you can geek out on all this to your heart’s content with a tribe of people just as committed as you. Plus, our members can use The War Hall to provide direct input on new features and services we roll out over time. War on the Rocks now has about 900 paying members. In addition to the revenue coming in from them, War on the Rocks will this year launch partnerships; its first, to be announced soon, is with the University of Texas’s Texas National Security Network (a project begun last year as part of Chancellor William McRaven’s “quantum leap” program to expand the university’s influence in a number of areas). War on the Rocks and UT are launching the Texas National Security Review, a print and online journal, later this year, and Evans is currently interviewing candidates to be the journal’s managing editor; he also recently hired an operations coordinator, the site’s first full-time employee besides him. I asked Evans whether War on the Rocks’ content has changed under the Trump administration. “With the last administration, whether you agreed or disagreed with them, there were people in the admin working on these issues and looking for creative solutions to complex problems,” he said. “We could publish articles about what to do on the edges to improve [various problems], and know that they’d be read. Other outlets see the opportunity in covering national security. Evans mentioned Modern War Institute (run out of West Point), nonprofit The Bridge, and nonprofit Small Wars Journal, which is run by a former Marine, as sites he particularly likes in the space. Atlantic Media launched Defense One in 2013. The U.S. Army War College and Marine Corps University are both creating new digital publications, and Evans says he gets at least one email a month from someone else who wants to start covering the space. War on the Rocks is somewhat unique, however, in that it is a business in the space, rather than a nonprofit or a site run by a public institution. “We weren’t the first people to get onto this, and in some ways, it’s been accidental, but I really do feel like the future of media is gonna be found in these companies that appeal to very specific communities of interest,” Evans said. “We built something and the passion and understanding of the issues draws in the market. I don’t think we’re unique in that regard, but I think that’s the future. We call the people who read War on the Rocks members of our tribe.” He plans to visit military bases and colleges this year, to reach out in person more and attract more readers that way. 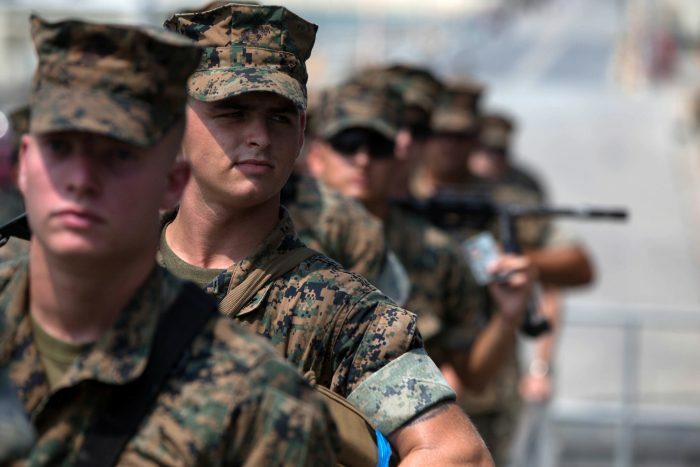 Public domain photo of Marines with the 31st Marine Expeditionary Unit waiting to board the USS Bonhomme Richard by the U.S. Department of Defense. POSTED March 30, 2017, 11:17 a.m.
Owen, Laura Hazard. "War on the Rocks is a national security site for a military “tribe” that knows what it’s talking about." Nieman Journalism Lab. Nieman Foundation for Journalism at Harvard, 30 Mar. 2017. Web. 24 Apr. 2019. Owen, Laura Hazard. "War on the Rocks is a national security site for a military “tribe” that knows what it’s talking about." Nieman Journalism Lab. Last modified March 30, 2017. Accessed April 24, 2019. https://www.niemanlab.org/2017/03/war-on-the-rocks-is-a-national-security-site-for-a-military-tribe-that-knows-what-its-talking-about/.